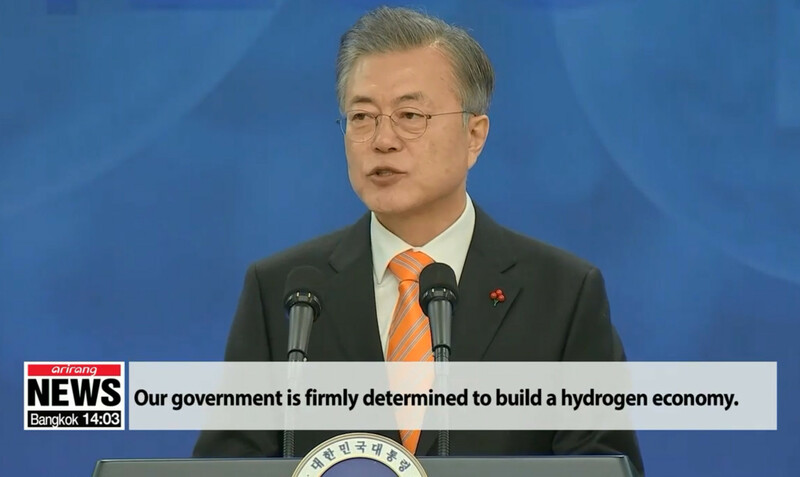 Moon Jae-in: "it is crucial that we take an early leadership position in the global hydrogen market"
S. Korean President Moon Jae-in: "At the dawning of the era of the hydrogen economy, it is crucial that we take an early leadership position in the global market. Our goal is to be number one in the world market in both hydrogen powered cars and fuel cells by 2030"
President Moon Jae-in listens to a Hyundai Motor manager explain hydrogen-powered vehicles and drones before attending an event on hydrogen power in Ulsan on Thursday. Hyundai Hydrogen Electric NEXO achieves SAE Level 4 Autonomy. Other manufacturers are struggling with SAE Level 2. Attention Elon Musk: Be Afraid of "Fool Cells". Very Afraid. 중국인들과 한국인들이 미국인들에게 다시 점심을 먹을 것입니다. 2. How is your hydrogen car doing? One poster on this very thread doesn't have a comment about Korea or hydrogen, but yet they continue to post the same comment over and over and over again. In other "forums", this would be called spam, and the loser would either be forced to stop or be banned.